Looking for private in-home or in-studio Korean lessons? Our Korean teachers are ready to get you started. Find your teacher today! The average cost of 60-minute Korean lessons is $46. While the exact cost will vary depending on the teacher, type of lesson, and your location, you should expect to spend anywhere between $18 and $70 per hour. For the best experience, we typically recommend 60-minute Korean lessons. However, students looking for a more affordable option may want to consider a shorter lesson length of 45 or 30 minutes. On average, 45-minute Korean lessons are 29% less expensive at $33, and 30-minute lessons cost 44% less at $26. Curious how much Korean lessons cost in your area? Do a quick search to get local prices for the best Korean teachers . "My daughter is enjoying her Korean class and is learning so much!! She looks forward to her class every time and her teacher is great!!" "I've only had one lesson with her but so far she has been great. Very friendly and helpful." leasant to talk to. I enjoyed my first class with her and am looking forward to the next few!" g and kept the lesson going. I am so thankful and I know I got the right teacher." "patient and friendly. Knows how to guide students :-)"
"Patiently explains and clarifies. Good pacing and allows time to practice conversations." Do you want to know more about Korea and the language? I am an experienced Korean language partner from University of Miami for college students since 2015. From beginner to intermediate, I will be your Korean conversation partner and teacher. I came to USA at age of 15 and learned English in Mid-West most of my life. I love using idioms in both language. In Korean up-to-dated direct translation of "you're welcome" is "what?" why? because they meant "oh no what are you talking about? don't mention it"
Let's learn the language while having fun. Take a lesson from me. I have taught English to Koreans back in Seoul for more than 8 years, so I know exactly how different these two languages are. Based on this understanding of how I need to approach non-Korean speaker especially whose mother tongue is English, I am confident that I can let you start studying Korean the easiest way and make the class fun with lots of introduction of Korean cultures and history. I have given out language lessons more than 10 years since I was at college. It was always 1:1 lesson. My students liked to learn and had fun from learning words and expressions. Learning a foreign language is definitely fun. So I pursue "fun-learning" lesson with you. I am also interested in linguistics. I can correct your pronunciation close to native speakers. Looking for some fun ways to practice your Korean language skills? Here, Severn, MD Korean tutor Keulin H. shares some fun and effective study methods to practice speaking Korean... Learning Korean can be daunting for beginners. Of course, working with a Korean teacher will help you get started with the alphabet and correct pronunciation of the different letter combinations. From there, practice makes perfect! So how can you practice? Here are five fun ways to practice speaking Korean. Do you want to take Korean lessons with the perfect teacher near you? If yes, then you’ve come to the right place. Private Korean lessons and classes with a TakeLessons Certified™ teacher - whether in-home, studio, or online - accelerates your progress, increases enjoyment, and improves every student's chances of becoming a fluent user of the Korean language. Private tutoring makes learning easy, it's more affordable than you might think, and it's the most impactful way to improve your skills for beginner or advanced learners. Our Korean tutors work with students of all ages: kids, teenagers, adults, and even seniors. They can teach you the origins of the Korean language, in addition to the vocabulary, the grammar, the punctuation, the consonants, the vowels, allophones, sentence structures, variations between North and South Korean, gender differences, and other technical aspects. Learn about and experience the physical, social, and emotional benefits of learning a foreign language like Korean. As a Category 5 language, Korean is one of the hardest foreign languages to master. It takes up to 88 weeks of deliberate practice to gain General Professional Fluency. A private tutor can help keep you focused, committed, and motivated, not to mention their ability to help you overcome any language hurdles you have trouble with. Your tutor offers you expert language learning techniques and tips, and helps you develop good practice habits, so that you can maximize your learning experience, and achieve your goals faster. Though learning Korean is extremely useful while traveling to South Korea, it also helps with career prospects and with personal relationships. Become a better Korean speaker, reader, writer, and communicator. 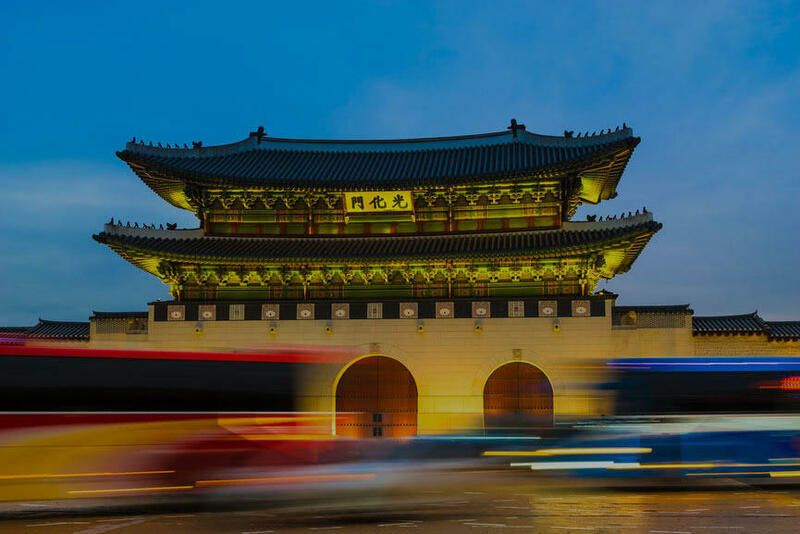 Students taking online Korean classes benefit from greater convenience, enjoy better rates, and can choose from a wider selection of teachers nationwide. If you've ever taken any foreign language classes over Skype, you'll love using our interactive TakeLessons Classroom. If you're considering study-abroad programs to South Korea, work relocation, international business opportunities, or general travel as a means to learning the language, immersing your self in the origin country and interacting with locals is a surefire way to accelerate your learning. Reading signs, menus, and local newspaper magazines while abroad could expose you to all kinds of spontaneous subjects. Conversing with or having to ask native speakers for directions or recommendations forces you to proactively apply your lessons. The downside is that many students, professionals, and travelers don't feel as confident in taking this approach. Not knowing the basics of the language could backfire on you, and lead to poor decision making. Traveling in countries where English isn't the primary language can be risky if you don't plan ahead. If you learn basic conversation and the most popular phrases for traveling, then you can combine this knowledge with immersion and return home a more fluent speaker. Taking small group classes to learn a new language is another good way to acquire basic language skills, immediate feedback, and human interaction. It combines both passive and active learning. A professional instructor leading the class can keep the agenda tight and ensure each student gets the chance to participate, and get their questions answered. It can also be more affordable than private 1-on-1 lessons. Find local group classes near you by doing a quick Google search, or better yet, sign up for TakeLessons Live, the new and affordable way to learn languages, and to learn how to play musical instruments in small groups of 5-8. You pay a flat monthly or annual fee, and get unlimited access to hundreds of classes online every month. Perfect for beginners.